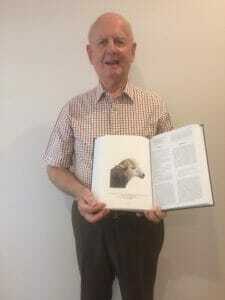 News of a Korean who wrote the Bible by hand inspires retired church worker. Those are the opening words of Psalm 23 in the Bible paraphrase authored by William Ackland and recently self-published in Australia. A retired church worker currently living in Cooranbong, New South Wales, Ackland, 79, set out to write-up a Bible paraphrase of his own six years ago, after reading a news story in a 2012 Adventist World magazine that, he says, he found inspirational. and when I need to drink, His still waters do not frighten me (v.2). If the fact that Ackland actually completed his project sounds amazing — his paraphrase runs more than one thousand pages and nearly one million words — his account of its genesis is not less spellbinding. and leads me along the right path where I can honour Him (v. 3). Ackland didn’t think his aging hands would endure so much handwriting, so he began to consider other possibilities. “What else can I do?” he wondered. Finally, on Monday, March 19, 2012, Ackland sat at his computer and began to type. for His strong arm and shepherd’s rod protect and care for me (v. 4). The process itself was painstaking. Exactly two years, one month and six days later, Ackland came to the end of Revelation, the last book in the New Testament. “There was still much to be done, of course, in refining the manuscript,” he shares. Finally, he thought The Gift Bible paraphrase was ready for the press. even when my enemies are near. my cup of joy overflows (v. 5). Since The Gift was published, and as he receives orders for the book from as far as the United States, Ackland is often asked what his motivation was in undertaking such a grueling initiative. Ackland thinks that only when we decide to go all the way and move forward in faith, we are abundantly blessed. And we are the first ones to benefit from it. “[Writing a paraphrase of the Bible] is something that will stay for me the rest of my life,” he says. and a place forever in His heavenly home. In follow-up communications with Adventist Review, Ackland confessed that occasionally, he stills reflects on what this whole Bible writing-up experience has meant to him. “What have I learned after spending nearly three years pondering every word of every text and reproducing it in my words?” he wonders. Besides the obvious blessings of delving into the Word and keeping it close to his heart, Ackland says he has learned a lot about what he calls “the promptings of the Spirit,” or those God-given urges to step up and fulfill one’s mission on this earth. * Ackland Bible paraphrase’ excerpts by courtesy of the author. All rights reserved. ** See “Adventist Credits Copying Bible Text with Spiritual Growth,” in Adventist World, March 2012, p. 7.